Below are my thoughts from the daily Bible reading of the West Side Church of Christ. Today’s reading comes from Matthew 19 & Mark 10. Before reading I invite you to pray and asked God to speak to you as you read his word. Also above in the tabs is a link to the Bible reading plan. I do not write what I am about to write in a proud and boastful way, only as a teaching element. In 2007 I graduated college with a degree in Bible and Theology. I spent four academic years of my life studying the Bible. I was given tools and knowledge to better understand the Bible. In those four years I studied nearly every book of the Bible on some intimate detail level. Sadly to say, it was not until 2012 that I actually for the first time read the Bible cover to cover. I had read it all over different parts of my life, but never in an organized attempt to do so. With all that training, with all that study, and with all the times I have read the Bible, especially many sections of the Bible, you would think it would be hard to have a new understanding, especially over familiar passages. I have always read the camel in the eye of the needle story independently without the follow up. At least I have never connected them. In the first part Jesus is teaching that in reality, there is nothing that anyone can do to enter into the Kingdom of God. Rich men cannot buy it. Poor man cannot be pure enough. Religious men cannot do enough. There is nothing you and I can do to inherit the Kingdom of God. But that is where God steps in on this matter … “Humanly speaking, it is impossible. But not with God.” I do not know about you, but that tells me there is something God is up to. As Christians we know the rest of the story. We know that Jesus will go to the cross … something He alludes to latter in the chapter … where He will pay the debt for our sins. 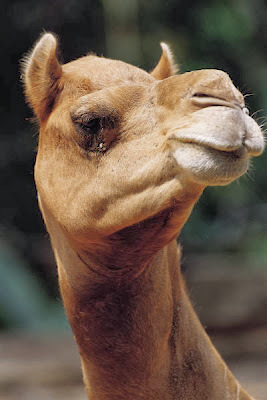 A camel goes through the eye of a needle easier because there is nothing you and I do to inherit the Kingdom of God. It is the work of God in Jesus on the Cross. Now I did not learn anything new in our reading today. I only saw for the first time this teaching Jesus used here in Mark 10 to illustrate it yet another time in scripture. Friends, no matter how many times you have read the Bible there is always something new and something different that you can draw from God’s Word.